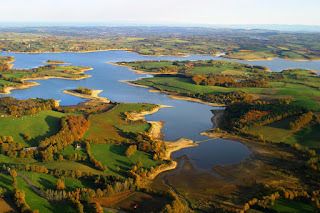 The beautiful Etang de Sault is located in central France and has a size of 25 hectares. The public water is especially popular with the local fishermen and contains several carp of at least 20 kilos. A big advantage is that there are many other beautiful public waters nearby, such as the giant Lac de Vassivière (1,000 hectares). Carp anglers looking for a nice and quiet public fishing water deep in the French countryside should definitely take a look at Etang de Sault, on a stone's throw from the larger town of Montlucon is located about 800 kilometers drive from Utrecht in The Netherlands. This 25-hectare public water, adjacent to the village of Sault in central France, is relatively unknown. Every year the French locals organize the popular carp fishing enduros, which are regularly reported about in the French press with very good catches of big carp during these contests. Etang de Sault has a fine carp stock with some fish of more than 20 kilos. In addition to carp is the more especially also known for the predatory fish (pike, pike and perch), which are being fished avidly by the French. We don't have any info about the record carp on Etang de Sault but several anglers have reported about specimen of 25+ kg over the last few years. Night fishing is allowed here and a big advantage is that there is around the lake a path that can be traveled by car. Fishing spots are sufficient. Generally, the water is very calm, especially outside the summer period. Near Etang de Sault are many more beautiful public carp waters, all riding well. Think of something northerly Lac du Val d'Auron (84 hectares) or the more southerly waters were open Le Pont du Dognon and covering an area of 1,000 hectares immense and especially beautiful Lac de Vassivière . By clicking on the map above will take you automatically to the detailed map of France and you can zoom in on all public and paying waters. You can also directly to the map of France via this link . Below a nice Youtube movie that gives a good impression of Etang de Sault.